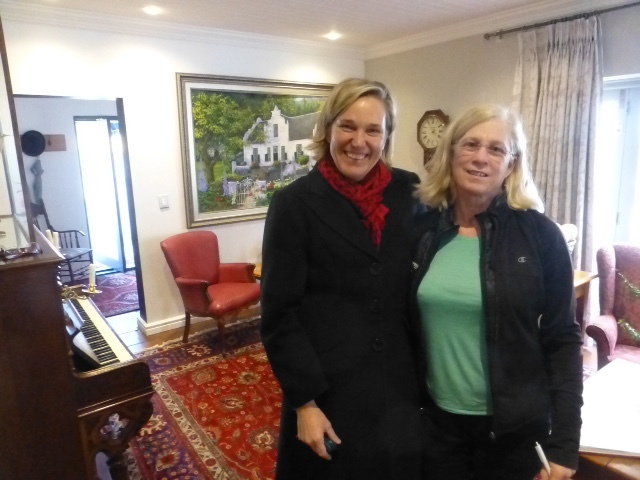 Our stay in Stellenbosch was superb and certainly was enhanced by the owner of our B&B, Mathilda. She one of these rare people who makes you feel totally at home and looks after your every need. 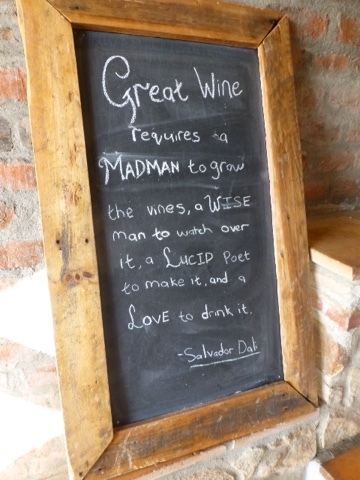 This memorable sign was posted at Uva Mira - I should have known Salvador Dali was into the grape! 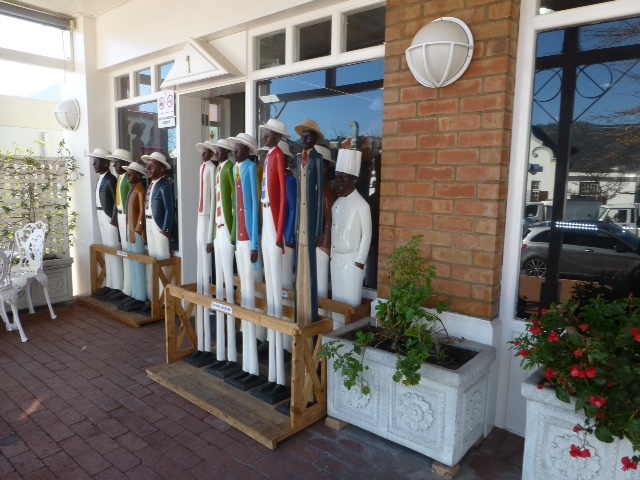 These wooden statues of extra tall and lean dressed up Africans appear to be ubiquoteaus and extremely popular. 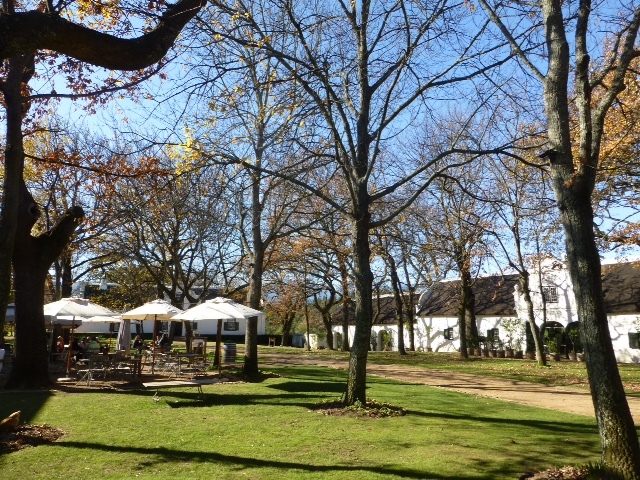 The grounds of the very old Boschendal Winery in Franschhoek. 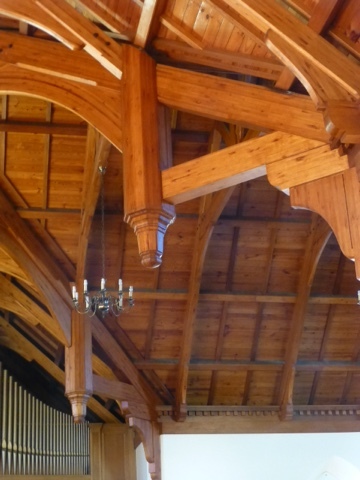 We visited an interesting church in Franschhoek of the Dutch Reformed Church - beautiful woodwork and a classic style pipe organ. 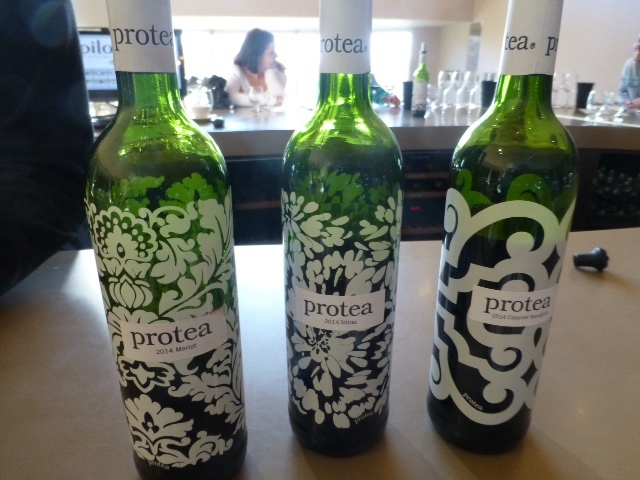 The Protea wines as well as several other label were part of the Anthonij Rupert Winery in Franschhoek. These are recyclable bottles that can be cut and upcycled to be used as glasses or vases. The Protea label is easily pealed off. The Rupert Winery wines were very good. 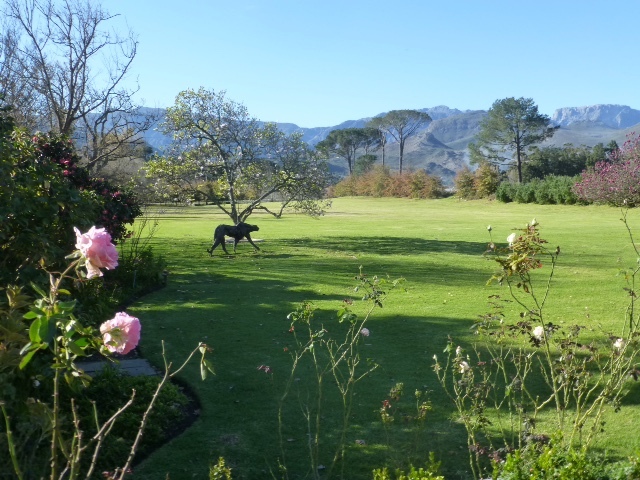 After Franschhoek we drove to Swellendam, where we stayed at a comfortable B&B - the Marula Guesthouse. Run by a German couple, Marion was very helpful in telling us about the surrounding area. 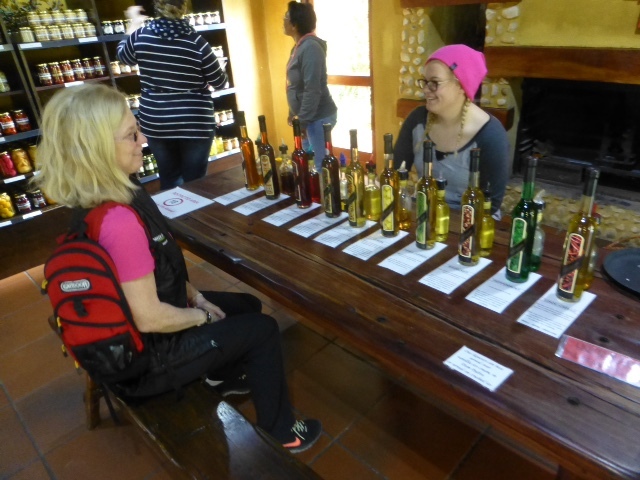 We stopped at the Wildebraam Berry Estate, where we sampled liqueurs made of a hybrid berry they had developed and at the nearby Marloth Nature Reserve. The reserve has a waterfall that can be hiked to in an hour's time. But with possible rain impending, we opted not to do it. 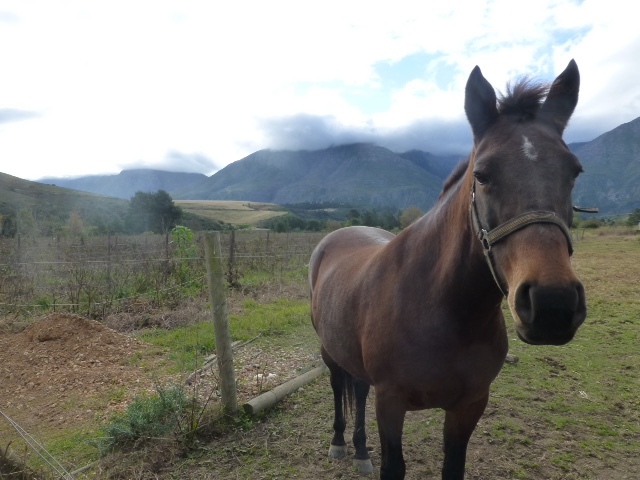 The berry farm also had some inquisitive horses on their property who we stopped to greet. 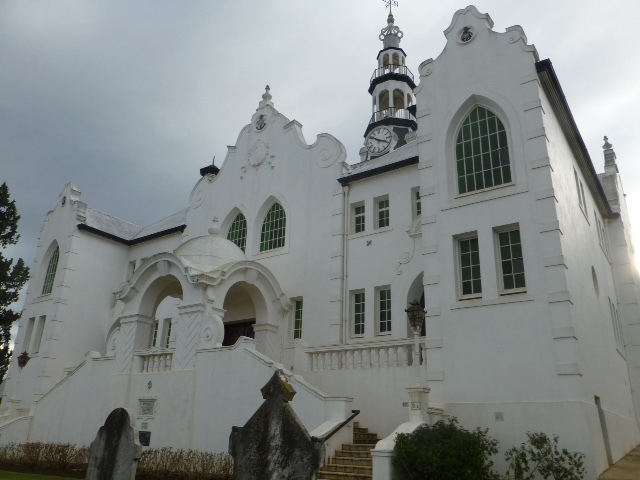 In the downtown part of Swellendam, we stopped in to see the huge, white Dutch Reformed Church, originally built in 1802. The windows are Gothic, the gables are Baroque, the cupola Eastern and the steeple is supposed to be a copy of a famous steeple in Belgium. Impressive, but we never did get into the church since it was closed on both days we stopped by. 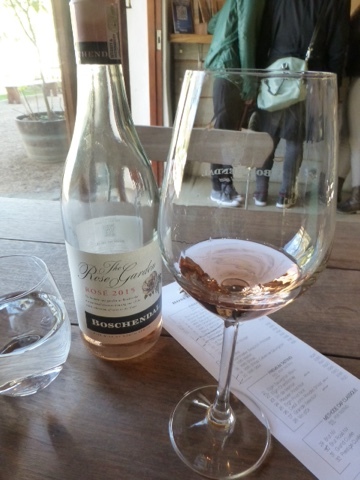 Some tasting notes: My favorite winery of the areas we visited was Neethlinghof - excellent wines and reasonable prices. 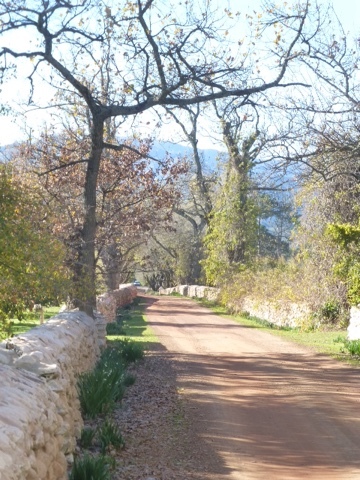 My second all around favorite winery was Uva Mira (with Ernie Els running closely behind). But of the whole bunch, there wasn't one I disliked. I went to Asara, Kleine Zalza, Lovane, Jordan, Anthonij Rupert (who had the only Sangiovese), Ernie Els (apparently a South African golfer, had the most spectacular tasting room and dining facility) and Boschendal, one of the oldest in the region.